Mangalore, Sep 10, 2014: Speaking at the inauguration of ‘Prajna’— value orientation programme for college lecturers, organised by the Ramakrishna Mutt here on Sept 9, Minister for Higher Education and Tourism R V Deshpande expressed concern over deteriorating values and morals in the society and urged the teachers to take a lead in building student power for the country to become a super power in 2020.He said that the country has made progress in the field of science and technology. Unfortunately, values are low and have resulted in increase in immoral activities and suicides in the society. Thoughts, aspirations, expectations and vision of Swamy Vivekananda are relevant even to this day. Values must be taught for children from higher primary level. No religion teaches hatred for mankind. There is a need to enrich our past, culture and values. In the past, there was a bond between the teacher and student. Today, the relation between a teacher and a student has become commercial, which is a bad trend, he said. When competition is too much and distorted quality is order of the day, teachers have to prepare youth to compete in the world market through values. There is a need to build a vibrant, strong India with culture and integrity, the Minister added. 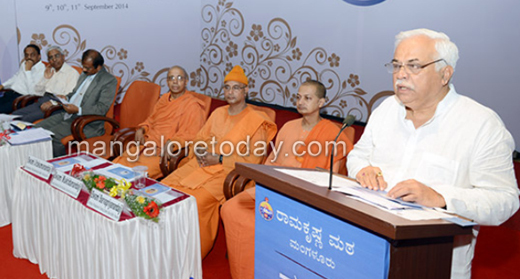 In his key-note address, Ramakrishna Mutt and Mission (Mysore) Trustee Muktidanandaji said that teachers represent internal knowledge army of a country. They dispel darkness in the minds of the people. Education enables us to bring out perfection in mind, body and soul. A teacher is a harbinger of knowledge revolution and infuses right knowledge to students. Teachers personality and aura will definitely influence the students. A teacher has to be a leader for character transformation, he said. The seer said that teachers are repository of all the culture of the society. Transmission of culture takes place through education. Mangalore University Vice Chancellor Prof K Byrappa said that teachers write future of the country. The country had a glorious past with Nalanda and Takshashila universities imparting knowledge to the students from across the world through art of living. “In the present global society, we prepare students with job oriented programmes. A teacher should incorporate five D’s with devotion in profession, dedication, discipline, direction and determination to become a role model to the students and society. In this era of technology, role of a teacher is challenging. The teachers should play a role of a facilitator to inspire and motivate students and incorporate values in them to become good citizens.” Ramakrishna Mutt (Belur) seer Swami Sarvapriyanandaji delivered a talk on ‘Spritualising life and work,’ Aerospace engineer Dr S Vishwanath on ‘An effective student is a successful teacher’ and Prof K Raghothama Rao on ‘Personal excellence.’ Ramakrishna Mutt (Mangalore) President Jitakamanandaji was present. The interaction was enthusiastic.